Samuel Strang Nicklin, “The Dixie Thrush,” was one of baseball’s great renaissance men. Born in Tennessee in 1876, he was the scion of one of Chattanooga’s most prominent families. His father John Bailey Nicklin served in the Union Army during the Civil War, moved to Chattanooga in 1866, and served as mayor from 1887-1889. Samuel Nicklin spent one year at the University of Tennessee where he starred on the football and baseball teams. He also had two short stints in professional baseball 1893 and 1896, which included 14 games with the Louisville Colonels in the National League when he was 19. Late in 1896, he enlisted as a private in the Tennessee Volunteers, served in Spanish-American War and rose to the rank of captain. 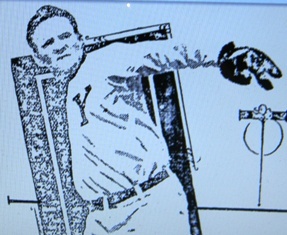 After leaving the service, Nicklin signed a contract with Cedar Rapids Bunnies in the Western Association and dropped his last name; he was known as Sammy Strang for the rest of his career. This “prejudice” likely had nothing to do with it given that in addition to serving as Chattanooga mayor, the elder Nicklin was active in professional baseball, serving as president of the Southern Association in the 1890s. 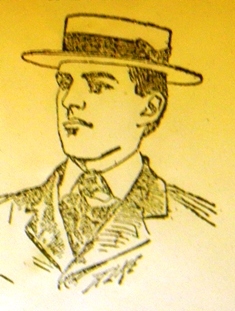 During the 1909 season, Strang began coaching the baseball team at West Point. He retired from baseball after playing from 1908-1910 with the Baltimore Orioles in the Eastern League, to study opera. During his baseball career, Strang was known for writing songs and singing but decided to seriously pursue a music career in 1910. He traveled to Paris where he trained under Jean De Reszke, one of the greatest male opera stars of the 1890s. Upon returning from Paris, he chose not to accept an offer to join an opera company and instead returned to West Point, where he continued as coach until 1917. Strang returned Tennessee shortly before his father’s death in 1919 to manage and take over ownership of the struggling Chattanooga Lookouts in the Southern League. While the Lookouts did not win a league championship during Strang’s tenure, he was credited with turning the franchise around and sold the team, for which he paid nothing 1919, for a reported $75,000 in 1927, while retaining ownership of the stadium, Andrews Field. Unfortunately, Strang’s most ambitious plan–to sign Satchel Paige in 1926–never materialized. Samuel Strang Nicklin died in Chattanooga in 1932.